If God has been tugging on your heart to have more children or you have had children after a vasectomy reversal you will enjoy this new book by Felice Gerwitz! 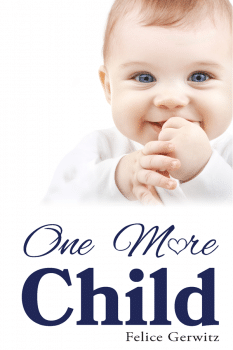 One More Child follows the author’s struggles following the couple’s decision to have a vasectomy after their first child was diagnosed with a genetic disorder. God tugged on their hearts to get a reversal 12 years later. This book follows their story as they fielded questions regarding their large age gap with their children and how they have been able to encourage other families in the same situation. This book is being offered as a free gift until 12/22/18!!! Hurry! Click here to grab this FREE Book now!